Pleural mesothelioma survivor Jack Riordan sounds a lot more worried about those around him — his caregiver wife, children, grandchildren and other patients — than he does about himself. Maybe that explains his strong belief in clinical trials. He wants to help others. 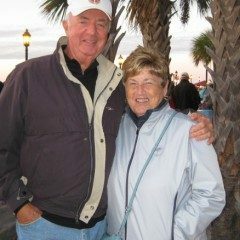 Riordan, 74, isn’t expecting any life-saving miracle from his treatment at the Florida Cancer Specialists in Sarasota. He merely is hoping that what researchers learn from his participation in the trial will move everyone closer to a future cure. Riordan is part of a phase I, dose escalation trial of MSB0010718C. It’s an immunotherapy antibody targeting the protein PD-L1, which protects mesothelioma tumor cells from the body’s own immune system. The trial drug is expected to have anti-tumor activity by stopping PD-L1 and restoring immune system action. The drug already has shown some success with metastatic breast cancer, metastatic colorectal cancer and non-small cell lung cancer. The PDL-1 and PD-1 proteins have become popular targets recently for a variety of immunotherapy drugs being tested at research centers nationally and globally. Riordan’s first treatment in November came with some tough side effects, which sidetracked him for more than a day. Yet he remained undeterred in his belief in the trial. He and his wife drive the 60 minutes to Sarasota every two weeks to participate. Riordan was diagnosed in June, but it didn’t come as a complete surprise to him. He had spent much of his career working with asbestos insulation, doing asbestos abatement and general contracting. He worked in the Northeast, but relocated to Florida 18 years ago. He was diagnosed 30 years ago with pleural plaques, an asbestos-related condition that can lead to mesothelioma. When the shortness of breath became an issue early this year, he knew it might be serious. Doctors told him the mesothelioma already had metastasized, eliminating most surgical options, leaving him with a 6- to 12-month prognosis. He underwent six chemotherapy sessions covering 18 weeks, but he stopped because of the negative effect on his white blood cells and bone marrow. Physically, Riordan still looks relatively healthy, although his lifestyle has changed considerably in recent months, even if it has changed grudgingly. He was hitting golf balls on the driving range earlier this year when he tore his pleural drainage catheter in his side. Riordan always overcame his medical problems in the past — triple bypass heart surgery and spinal fusion — but knows mesothelioma is different than any obstacle he has faced before. 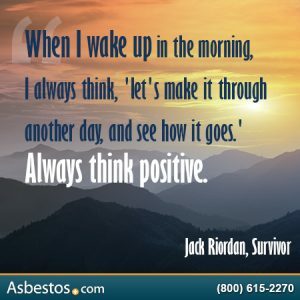 Riordan has been an active participant in The Mesothelioma Center’s monthly support group conducted by Asbestos.com. He has made himself available to help and counsel newly diagnosed patients. He talks glowingly of the care he has received at the Florida Cancer Specialists treatment center. He won’t know if the medication is having a positive effect until after the fourth treatment and the CT scan at the end of December. Still, he has remained as upbeat as ever.